I'm sad that it took so long to watch this anime this week; the blog work really took a lot more time than I had wanted. Meanwhile, with the visiting of relatives this week, I'm pretty much out of commission except for a few precious hours where I hide in a dark corner with my laptop. I'm surprised that Yui isn't the "top". This batch of episodes took the love-love to a new level, with blatant confessions from many of the characters. Of course, keeping up with the show's nature, none of them were taken seriously, thus not ruining the careful balance between the characters. Ep06 featured various past-times that the girls in the club engaged in (pictured stories, clay modelling, etc), while ep07 was a Christmas-themed episode that ended with New Year's Day. Poor Akari. Her transformation failed so hard. Ep06 had the longest opening of this series (as far as I recall), with Kyouko pretending to be Akari and trying to do the intro. When caught, she segued into a "little gag", which was essentially the girls turning into super-shoujo versions of themselves (with Akari, very typically, failing). That aside, the first part after the OP had Kyouko being approached by a first-year that wanted to know how to make her drawings better. Once again, Kyouko demonstrated that she was really some sort of prodigy, revealing that perhaps she had no idea how to actually become better at drawing. (Her suggestions were random "cool-sounding" words, like "heart", "willpower", "conviction", etc.) If this was real life, I'm sure I would be greatly disturbed by such a person around me. Luckily, this is an anime, and I find her character awesome. 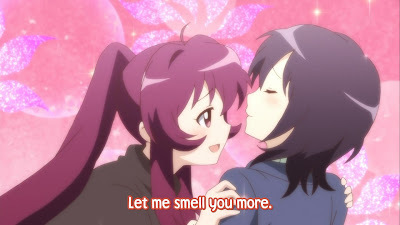 The episode turned into a picture-story of Kyouko's without me realizing, although I did wonder why the show suddenly went so super-lesbian. 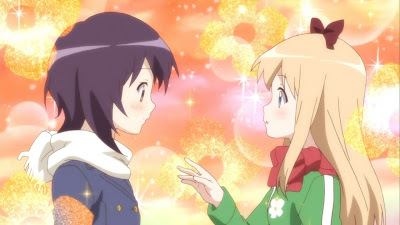 Essentially, Kyouko's "confession" to Yui was accepted and the two embraced passionately outside the school...only for it to turn out to be just a story that Kyouko had drawn and was showing to the other girls. Chinatsu's intense jealousy caused her to rip apart the papers (although the original, held by Kyouko, eluded her). In response to the story depiction, she vowed to make her own story that would stun the girls. Indeed, it did...as it was so horribly drawn. I really want to question how bad the pictures might have been in real life, considering Kyouko and Yui were so scared that they shivered and hugged some pillows. Maybe Japanese girls just get scared easily? 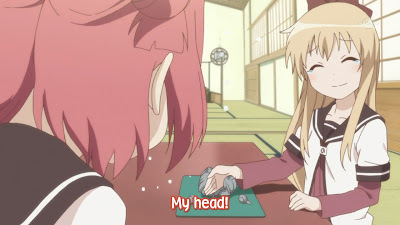 Part two of the episode (as wonderfully announced by Kyouko) was playing with clay, partially to avoid the rest of Chinatsu's horrific love story. Akari's first creation was a rabbit, which Kyouko commented was pretty normal. 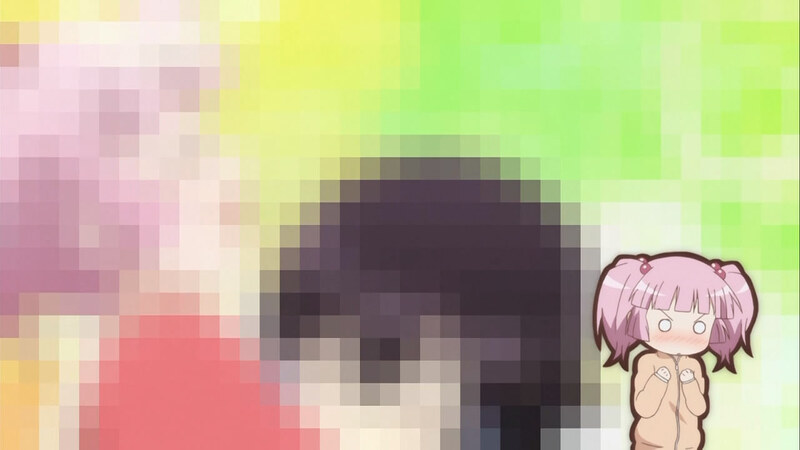 I don't understand what kind of world this anime is set in; I thought that rabbit was amazing. I wouldn't be able to do something like that so quickly. Anyway, Kyouko's creations were Chinatsu cosplaying as Mirakurun, in some pretty suggestive and lewd poses. Yui worked hard at making dumplings and pastries, and Chinatsu's creations were covered in a mosaic, in order to hide their hideousness I assumed. Akari, while not possessing a strong presence, is really amusing; she continued all the jokes about her hairstyle by even getting scared that they had fallen off, after seeing a replica of the buns (in clay) on the table. Yui gets a little more boyish with each daydream. The final part of the episode was a visit to Yui's house once more, where her younger cousin was visiting for the day (and playing with the lewd Chinatsu/Mirakurun figure). I suppose this is another one of those anime where younger/older relatives of main characters look like younger/older versions of themselves (see A Channel). The cousin, Mari, thought that Chinatsu was actually Mirakurun, leading to Kyouko providing a costume and Chinatsu cosplaying the entire day. It wasn't that amusing of a scene, since I'm not actually that fond of Chinatsu, but it was sad that Mari found out the truth at the end. She quietly dealt with it though, only commenting that life was sour. Poor Akari. Even her likeness is abused. I'd be remiss if I didn't comment on the "follow-up" to the violation scene from the end of ep05. There was, as expected, no mention of it. 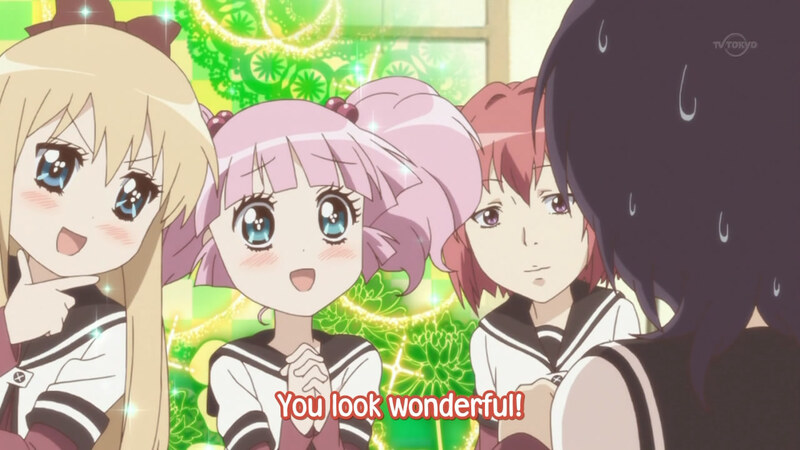 The lesbianism was amped up in this episode, with several declarations of love and Chinatsu imagining getting married to Yui; if anything, that was the only "repercussion" to that scene, where Chinatsu had made her feelings clear. After much more thinking about it, I'll really try to get passed the irritation I felt with the scene. In the end, there are different lines that are crossed with humour and, surprisingly, this one was too much for me. But I'd rather not be close-minded and prudish; I don't think this anime will propagate an increase of sexual-type violence among school-aged children, so saying that it's "going too far" is really just making a mountain of a molehill. That said, I'm still bothered. With time, I hope I'll move on for real. Ep07 was focused on Christmas, highlighting just how long has passed in these seven episodes. Kyouko's brilliant plan was to draw lots to turn the 8 of them into couples, so they could go out on a date for the holidays. 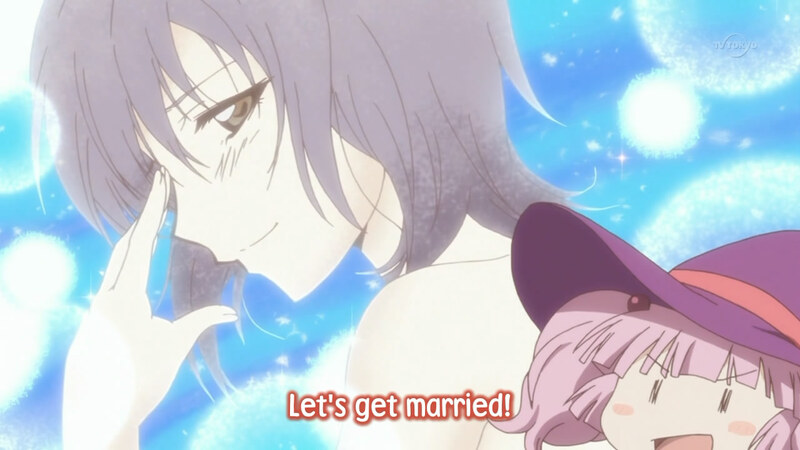 Naturally, everyone wished vehemently for various pairings and, other than Kyouko, no one got their desire. 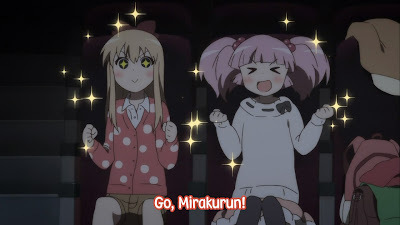 She's really some kind of deus ex machina sometimes... Kyouko took Chitose to see a Mirakurun movie in the theatres and, surprisingly, Chitose had been converted into a fangirl by the end. The stop at the arcade included Kyouko winning a (hideous) cat's head stuffed toy for Chitose. (I noticed that, from the price in the window, the thing was about $35 for purchase. Isn't that really expensive...?) Kyouko seemed to have really succeeded, since Chitose even agreed to hold hands at the end of the day. Yeah, she should have left those at home. No way! They must remain friends! Chitose and Akari made for a boring coupling, since neither of them really provide much enjoyment for me on their own. 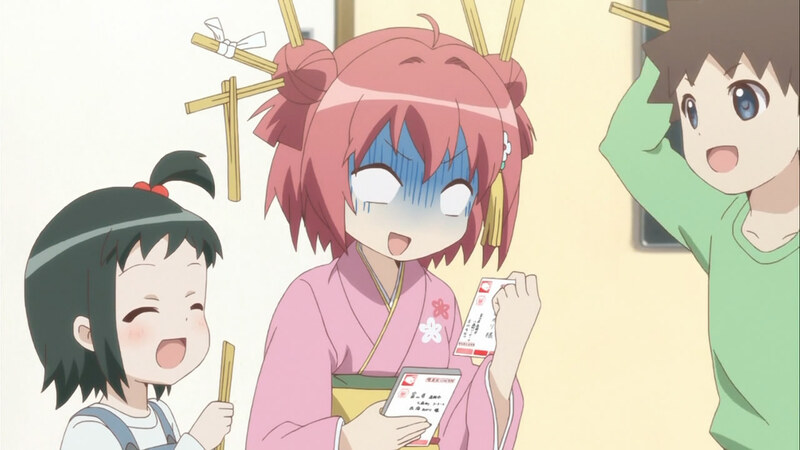 Chitose brought along a box of pickled radishes to thank Akari for the time that Akari handed her tissues in a previous episode, and then they went to go have anmitsu. Meanwhile, Ayano and Yui had been paired together, but never left the "starting point" at the park. Rather, they just sat on the bench and had polite conversation. When the topic shifted to their "other halves" - that is, Chitose and Kyouko - the two opened up a little to each other, and the love polygon was truly completed. Despite the hinting and undertones of "forbidden love", I really do like the friendship shown with Yui and Kyouko. The last third of the episode was dedicated to New Year's at the four main's houses. Akari was decked out in a rather lavish kimono, being quite polite even to her own family members. I'm a little sad that her older sister wasn't shown; after that "introduction" in the first episode, I really wanted to see her! It turned out that Chitose's older sister was friends with Akari's older sister, making it obvious that a future sighting is in the works. Chitose played around with her delusions of what she wanted from Yui in the new year, while Kyouko seemed to have slept the entire day (until the money arrived). 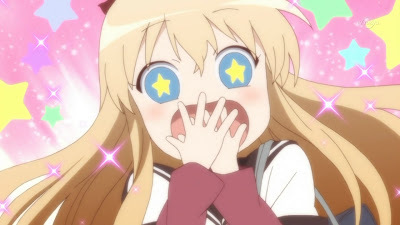 Yui entertained Mari in her incredibly large house (and it seemed that Mari believed Chinatsu was Mirakurun's sister). I understand now how she, being in middle school, can afford to live in that loft, even if the building is owned by a relative. Her family seems very rich. Old money! What a huge leap from just wanting a kiss. Watching these episodes was highly entertaining, and I didn't feel the time go by at all. While this anime makes me think about how "touchy feely" the Japanese youth really is, it's still incredibly funny and a really good watch. It's definitely getting high ratings from me.